Solitaire is a French word meaning "alone" or "single." So it shouldn’t be a surprise that solitaire engagement rings contain only one diamond. It’s just the gemstone and the band. Sounds boring, right? But it’s not. Solitaire engagement rings are elegant and beautiful in their simplicity. After all, less is sometimes more. Size is important when it comes to solitaire engagement rings. An extremely small gemstone may look lonely and overwhelmed if placed in a solitaire setting. The gemstone doesn’t have to be huge, but too small won’t look good either. However, your budget goes a long way in determining the size of your stone. Novori Jewelry has over 50,000 certified diamonds available in every price range. Can’t afford a large to medium sized gemstone? Don’t worry. Solitaire engagement rings can offer a few alternatives. Just as important as the size of the gemstone is the size of the band. Solitaire engagement rings often look best when paired with thin bands – especially if the gemstone is small. A larger band works best with larger gemstones or with settings that allow multiple gemstones. Many couples prefer to "dress-up" their bands instead of choosing a large gemstone. This can include having the band engraved with names, dates, or decorations. 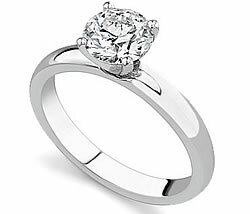 The most popular shape for solitaire engagement rings is the classic round shape. It’s inexpensive, quick and easy for jewelers to create. But what if a round shape is too traditional or boring for your taste? Well, there are alternatives. Solitaire engagement rings can basically use any shape available for any other setting. It’s not uncommon to see solitaire engagement rings with marquise, emerald, or oval-shaped gemstones. A less common shape for solitaire engagement rings is the heart. Not only is the heart shape unique, but it draws attention from the size of the gemstone and instead focuses on the shape. Prong settings are usually always used with solitaire engagement rings. This choice is logical because the prongs are unobtrusive, and highlight the gemstone while holding it in place. The size and number of prongs used is a matter of personal choice. As mentioned earlier, you can "dress up" the band to make the ring fancier. Adding a personalized touch to your band will make it more special. Gemstone quality is very important when it comes to solitaire engagement rings. A ring containing multiple gemstones can get by with lower-quality stones because the more elaborate the setting, the less noticeable the imperfections. But if you have only one gemstone, then you better make sure it’s a good one. Before shopping for your ring, acquaint yourself with the characteristics of an excellent gemstone. At Novori Jewelry we can tell you everything you need to know, but it doesn’t hurt to educate yourself in advance. Learn all you can about how clarity, carat, cut, and color affect the quality of a gemstone. If you have any questions regarding certified diamonds or how to select the perfect diamond, call us anytime at 1-877-877-4141. We are here to help.